Do these warmer temperatures have you planning for spring? It’s the perfect time to add Move for the Kids 5K Walk/Run, presented by C.H. Robinson on May 15 to your calendar for the chance to kick off your outdoor activities and – most importantly – make a life-saving difference for the patients of Ann & Robert H. Lurie Children’s Hospital of Chicago. Register today to join 3,000 other participants for a fun-filled, inspirational day! 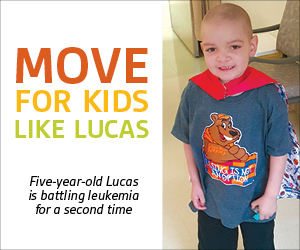 Move for the Kids 5K Walk/Run began in 2005 and is Ann & Robert H. Lurie Children’s Hospital of Chicago's annual signature 5K. The event has raised nearly $3 million for the patients and families at Lurie Children's. This is the perfect event to bring family and friends together to support the kids! Funds from the event ensure patients receive the best care possible to help them live a brighter, healthier future. Address: 1410 Museum Campus Dr.